Far away from the hustle and bustle of a modern city, Chidaogre village in West Garo Hills district of Meghalaya, located about 25 km from Tura is one such destination. The people of this tribal village have their own legends to tell, which will mesmerise any visitors to this ancient and rare location. This small hamlet is located at the foothills of Rangira peak, home to exotic variety of flora and fauna. It has a population of 47 households. Food is life. The Garo delicacies are hot. The mouth watering foods comprises of meat with lots of chillies. The main dish is called the Kappa, mainly made out of chicken, beef, fishes and pork. The Garo cuisine is varied, but chillies though remain the main item in most cuisines. Fishes cooked in fire inside Bamboo called Brenga taste delicious. This dish can make your taste bud crazy about the item. Definitely, you would like to learn how it is being prepared. It is mostly prepared from local fishes found in the nearby streams and rivers of Garo Hills. Nakam or the dry fishes is part of their diet. It is served with the food at lunch or dinner. Without Nakam, the food table in Garo village is incomplete. 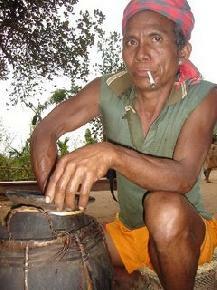 The tribal in north east are known for their perfection in brew preparation. This is used as a refreshing drink and is intricated with their colourful life and culture. You can taste all this food and sit for a relaxed evening with Garo music and engage in dance after getting high on Bittchi and Dikka. These are made out of rice and fruits. 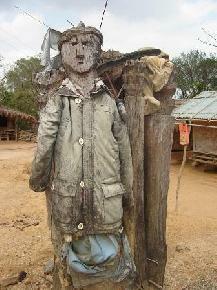 If you would like to go deep down into their culture, make a Garo friend, and go along with him to the village. The villagers has their own legend to tell about their customs and traditions. Where do you get this first hand information from? Most of the traditional are in its oral form. With modernisation and advent of christianity, almost 95 per cent of the Garo tribes are now converted. It has therefore become rare to find the unconverted Garos or the Songsareks. Chidoagre is one such village, where we find these humble, hospitable and colourful people. These people have their own form of religion, culture and tradition. However, the unique tradition of the Songsareks is fast diminishing. The villagers of here are yet to be converted. Marson Momin and Zingon Momin are two such people, who are aware of the fact that their culture and traditional beliefs is disappearing and in a few decades from now, their rich cultural tradition will only be read in books. Scholars and researchers are engaged in preserving the tradition of the Songsareks, Chidaogre is an example of their initiative. Zingon Momin says "People (Sahib's) very often visit our village and spend the whole day with us engaging themselves in enjoying dikka (rice beer) and merry making." 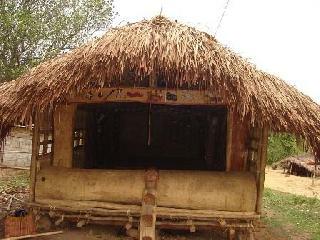 It is an exemplary village in Garo Hills, where the Songsareks life style is evident. The people live in Songsarek architect bamboo houses. The bachelor's house 'Nokpante', the ceremonial structure Amua, in rememberance of the departed soul ', the statue build in memory of the departed one 'Kima' and what more do we need to know about these people. All are evident. Anyone who visits this village will be thrilled to learn and experience their stories and at the end of the visit will say, "We'll come again soon."